Oops, so it has been a ridiculously long time since my last post. Admittedly, finding crafting time has been difficult with a little boy around and then also finding time and a tidy space for taking photos has been next to impossible, but enough is enough. I have been pretty productive and shall share what I can here. Bad photos though. I haven’t got photos of much, which is annoying as I’ve had some pretty successful makes in the past year, but I did grab some poorly arranged snaps of some of the gifts I’d made for Christmas this year. 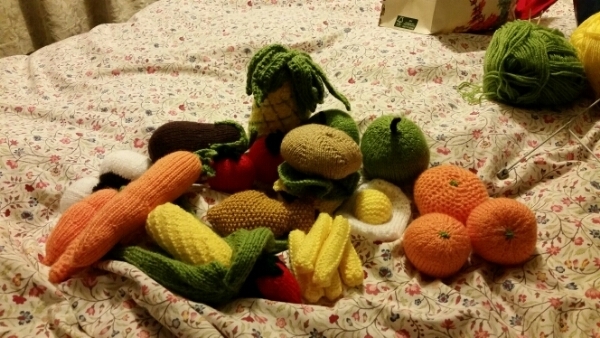 First up we have the play food I made for my little boy. I hadn’t decided if we were going to get him a play shop or play kitchen so it’s a bit of an odd mix, but at least it’s not more hard plastics in the toy box! So we have a mixture of fruit and veg, a fried egg, cheeseburger and fish and chips. It seems to have gone down well with the recipient and I shall add to it as the mood takes me. All the patterns so far are from the twenty to make series. Next up we have a jumper and stuffed toy set I made for my nephew. My little one was also supposed to get one, but I ran out of time and only managed to get the front cast on. The pattern is Peter Pan 1146 and was straightforward, if a little tedious with so much plain stockinette. 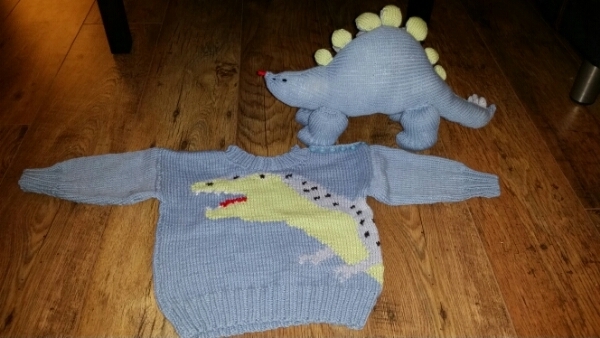 I added buttons along one shoulder to make it a little easier to get on and off and forgot to stitch the lines on the jumper dinosaur or the spots on the stuffed one, but I don’t think it matters. 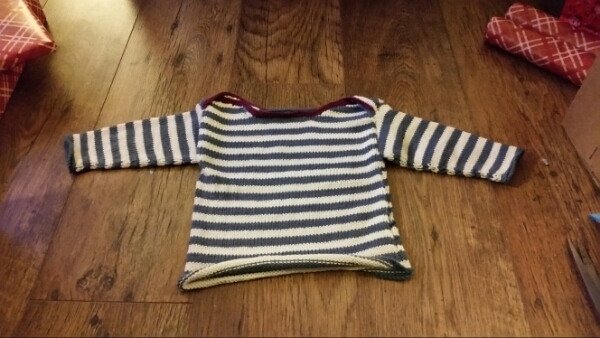 The next jumper was a gift for my goddaughter, I did adapt this so that I could knit up to the arms in the round. The pattern is Sublime 6013 and is a little bit of luxury knit in cashmere merino silk. I like it, but I have to say I find the envelope shoulders a but thick, I’m not sure I did these right and would like come clearer instructions or images. I also made an apron for my mother in law based on one she had made at school and loves, but it was falling apart, the fabric too worn. It was more of a smock than an apron, but the photos are too bad for here. I did get to try out the embroidery stitches on my sewing machine though! OK, that’s it for now. I would like to try and post more this year as I think I have gotten a lot better on the sewing front and I have some excellent patterns lined up to try. I might also try a couple of sewing book reviews as I have bought a couple that I really have been impressed with and I think they’re worth sharing. The photos probably aren’t going to get any better though.